Several annual vines provide fast, easy coverage for trellises, fences, posts and window boxes, often for no more cash outlay than the cost of a single seed packet. Many annual vines sport beautiful, fragrant blooms. They will twist themselves around a simple support structure, but make it sure it has slats or holes to twine through. A cement or wooden building, for example, needs to be fronted by a trellis so the vines have “footholds” to climb. Although not the tallest of the annual vines, vining nasturtiums quickly cover 6-foot trellises, posts and mailboxes, providing splashes of color in areas where much else won’t grow. Vine varieties range from multi-colored to single-hued. Nasturtiums actually prefer poor, dry soil, so establish them in marginal areas, such as a chain link fence or against a shed--or just let one or two vines sprawl on the ground in the vegetable garden to help ward off the dreaded squash vine borer. Alternatively, let the vine trail from a window box or hanging basket. Nasturtiums offer the bonus of edibility. Chop the leaves, petals and buds into green or fruit salads for a floral-peppery flavor accent, and pickle the young seeds as a kind of “poor man’s capers.” Plant nasturtium seeds in late spring. Nasturtiums thrive in sun or partial shade. 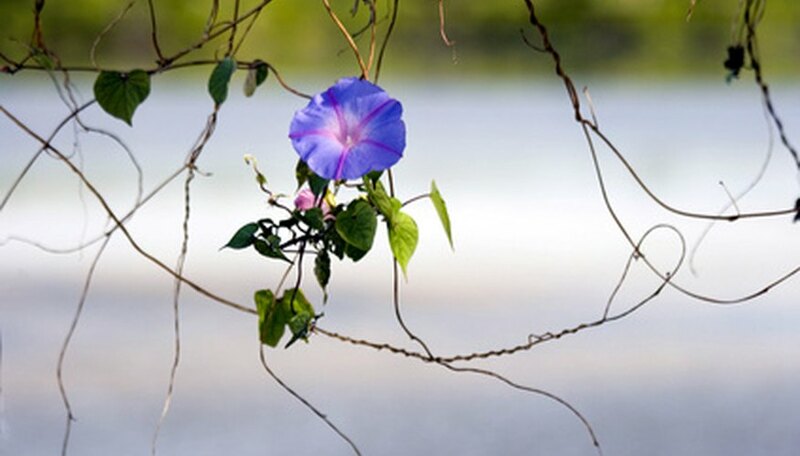 A great choice for tall trellises, morning glories are known for their rapid growth and ethereal beauty. The classic morning glory bears bright blue blooms, but many nurseries now offer red, white, pink and variegated cultivars. The trumpet-shaped flowers live for just one day, emerging in the morning and closing in the evening. New flowers replace the spent ones each day. The heart-shaped leaves add additional ornamentation. Like nasturtiums, morning glories thrive in sun or part shade, and aren’t fussy about soil conditions. Although they have a sprawling nature, the vines are lightweight. The National Garden Bureau advises nicking the seed or soaking it overnight to ensure germination. Plant seeds or seedlings about 1 foot apart. A relative to morning glories with similarly-shaped flowers, white-blooming moonflower vines act as mirror opposites to the morning glories. Moonflowers save their show for sunset, then close in the morning. They are excellent for nighttime gardens, not only due to their nocturnal blooming habits, but because of their luminous white flowers which glow in the moonlight. In her book "The Garden Primer," writer Barbara Damrosch notes that in southern climates moonflower vines grow so vigorously that they need stronger trellising than morning glories. Like nasturtiums, scarlet runner and hyacinth bean vines do double duty as rapidly-growing ornamental vines which also provide food--in this case, green beans. The large, deep red flowers of the scarlet runner, and purple blooms of the hyacinth, provide so much ornamentation that some gardeners grow them purely for show and ignore the beans altogether! Grow these bean vines as you would other pole beans--on bamboo teepees, along the vegetable fence, or on a trellis. Give them full sun and plenty of fertilizer. Harvest beans continuously through the growing season. Hyacinth beans tend to grow more vigorously in southern climates. Plant either variety 6 to 12 inches apart in late spring. Additional rapidly-growing annual vines worth considering include the annual sweet pea, with its sweetly-scented pink or mauve flowers; balloon vine, with showy seed pods and small white flowers; and cup-and-saucer vine, noted for its tall height and purple flowers. Others vines in the morning glory family include scarlet starglory and cardinal vine, which both bear deep-red blooms.